Almond milk can be an ideal choice for all who want to replace cow's milk with milk of nuts. Why is that so? Just because almonds are highly nutritious have omega 3 and omega 6 acids, magnesium, a lot of calcium, zinc, so everything we need as a daily dose of vitamins and minerals. Almonds belong to a group of nuts, they are very good for heart and blood system with important omega 3 fatty acids, minerals and vitamins. Given their calories, almond milk is an excellent source of energy, helps boost bone strength, better skin appearance, healthier nails and hair, memory and concentration, and increases the confidence. In only 100 grams, they contain as much as 634 calories, so we advise caution in their consumption, but do not overdo it. Almonds are very rich in fat, but it is of great benefit to the heart, it is a good source of calcium, its monosaturated fatty acids maintain our cholesterol in the blood under control, vitamin E helps prevent the accumulation of plaque in the arteries, while calcium contributes to heart regulation and normalization of blood pressure and the construction of bones. Before it was thought that they contained too much fat, for it to be a healthy snack, but now it's known that 90 percent of this foods is contained from unsaturated fats and that it is very useful for a child that involves losing weight and weight loss - once again, if dosage is right it gives us a sense of satiety after consumption. One thing to keep in mind is that if almonds are consumed in the wrong way, or if you do not leave them in water overnight, you will not be able to extract all the nutritional elements that you need. This means the following: Take a handful or two of almonds that you will need for your almond milk and place and in a suitable glass bowl, and pour hot water and cover with a cloth and leave overnight to stand like that. It takes 8 to 12 hours for our almonds to neutralize enzyme inhibitors. What we need to remember is that almonds should always be soaked even in cases where we do not have to make almond milk, but we plan to use them as healthy snacks. For our milk, date palms have a significant role to play, though you can use a natural sweetener or whatever you want. Date palms are a large source of magnesium, calcium, zinc, give caramel texture to your almond milk and are ideal in this combination. In addition to these two ingredients, we need water, and we can use cocoa powder, everything you would otherwise use with cow’s milk. For almond milk we need: fresh almonds, date palms, vanilla stick and water .. The water is poured in proportion 1/3 in relation to almonds, meaning one cup of almonds, we pour 3 cups of water (you can use 2 if you love dense texture). Put a cup of almonds in the blender and pour it with 3 cups of water, then add date palms. Make sure to remove all the pits, and also it is desirable to pre-soak them because the almond milk will be much finer in this way. What we like to add to milk from is also a vanilla sticks (cut it in the middle and add a little vanilla in the mixture with the tip of the knife). All that has yet to be done is to pour everything in the blender. After the blend, the milk obtained must be processed through the strainer. The staple that is left unheated can also be used for cakes, like almond flour and the like, so you do not even need to throw it away. Congratulations, you have made excellent almond milk, with beautiful white color, very similar texture as cow milk. You can immediately pour it into the glass and drink it. You can also add cocoa powder to it, whatever your choice is or you can use it in your recipes. Now that you know how to make almond milk, we will give you a couple of suggestions on how to use it for your skin and face. Although there are various almond preparations for this purpose on the market, you can also use this milk that you made. Our recommendation is to use it for face care, however, prepare the milk with a lot of denser texture (add less water) to make it more compact and better for smearing. Almonds will restore shine and elasticity to your skin, clean it from all unnecessary impurities and act preventively when new wrinkles arise. It is recommended for all types of skin, it is also good to remove makeup with it. We suggest you read these two great texts on this topic: the best moisturizing cream and oily face skin. If you find a good product of almonds that is intended for face skin, and if it is natural-free of chemistry, feel free to recommend it here to our readers. Almond oil is an even better preparation for this purpose, and we will try to give you a recipe in one of our following texts. Like all other nuts, almonds are also recommended for pregnant women because they are genuine small energy bombs rich in proteins. Almond milk is extremely pleasant and has a mild flavor that will also appeal to future mothers and give them enough energy for the whole day, much more than cow's milk. However, you need to consult with your doctor who follows pregnancy and your condition. Make sure you do not overdo it, add moderately mentioned foods to avoid counter-effect. When preparing yourself almond milk, be sure to follow the instructions we mentioned in the text above. This means the obligatory immersion of raw almonds in the water during the night (8-12h). The proportions of 1/3 in relation to the water and the squeezing through the gauze the prepared mixture to separate it from the pulp. Pregnant women have many benefits and we recommend that you read the text about nutrition in pregnancy. Another recipe is not for almond milk, but it's believed that this drink is even more effective and better for our health. We need almonds, honey and cinnamon, water and some salt. Fresh almonds are placed in the blender, the next ingredient that is added is cinnamon to help us control blood sugar, helps insulin work more efficiently, while antioxidant helps us fight various infections, stress and oxidation. It is useful in weight loss diets. Add the honey to taste depending on the amount you want to get. The health benefits of honey need to be mentioned here. Add the water if you like, then you can also regulate the density of the beverage later. A few grains of salt will at least point out the sweetness of the beverage. Mix in the blender until all the particles small. 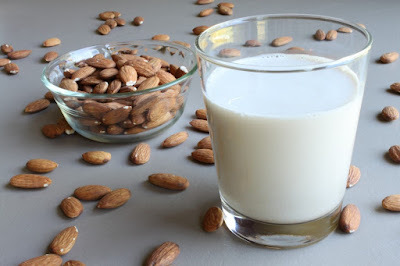 You can drink almond drink as a snack, and because of the nutritional value of the ingredients, one glass can serve as a replacement of the entire meal just like almond milk. The good advice is when you drink it, is to wait for a little reaction of the organism, which probably has been used for years to a purely full stomach. It is the fact that fullness is provided from healthy foods regardless of quantity, it takes a bit of patience to get the organism back to its natural state of optimal food needs, but it is certainly possible to achieve it with some good will. Of course, if your own health is sufficient motivation, we recommend text intolerance to lactose.